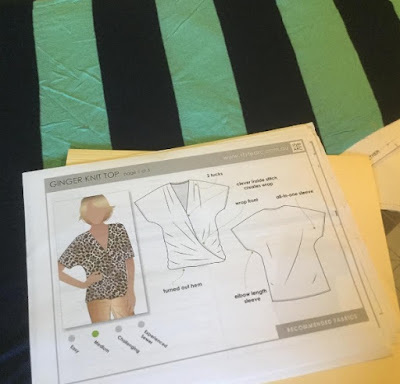 I seem to be on the hunt for the perfect dolman pattern, which is weird, since it's the easiest possible top to sew. You'd think I'd have one by now! Today I'm showing off the Style Arc Ginger Top, which I actually muslined! It's been a year since I made a muslin for anything! And that was for bridesmaids' dresses for my sister's wedding, so kind of important. But I wasn't quite sure on sizing for the Ginger Top. The reviews I looked at made it seem like there was a lot of volume (just by looking at photos). I'm also nursing, so my bust size is not indicative of my actual body size. Given all that, I ended up muslining a size 4. One big change on the muslin--I did not sew the twist in the front. I basted it, but it looked weird. And frankly, I wanted the front to be open for breastfeeding access, that was the whole point of this pattern for me. I'm sure you see what I see, that it's kind of small. Parts of it fit well, but others do not. Rather than start over with a larger size, I ended up altering this one. The back neckline was too tight and it needed graded out at the hips. I also wanted it longer. This one might be just a touch too big? I think it borders on personal preference. I get it. I have sizing issues. I hardly ever get the right size. But fit-as-you-go doesn't help me with a final master paper pattern, does it? Also, the lighter pink is interlock and it stretched a lot while sewing. Using a more stable jersey, like the darker pink, will be better for any future tops. I promise I pressed it but those wrinkles are persistent. Again, I did not sew the twist in the front. Now I can wear a nursing cami underneath and this is perfect for breastfeeding. I did sew a small snap to the center front to keep this closed when I'm not nursing. I bend over a lot picking up babies and it was blousing a lot in that circumstance. Obviously, if I had sewn the twist then that wouldn't happen. Here's a crappy photo to show the blousing. I was going to take one straight on but it wasn't family friendly! The only part about this I'm not sure of is the pleats in the shoulder. They seem kind of fussy and maybe unnecessary? You didn't even know they were there, did you? You can see them in the line drawing. A quick note about the instructions: Style Arc is infamous for bare bones directions. I've looked at other patterns like this one and the front is usually one giant piece that folds up at the hem. This one is two pieces, a left and a right. It helps save on fabric but it was just a little tricky to sew. I recommend following the diagram rather than the written words. It WILL work if you follow the diagram. Additionally, there was a line about hemming the center front but it's supposed to be turned back twice. It only says to turn it back once? Just thought I'd throw that out there if you happen to follow instructions right to the letter. The one thing I LOVE about Style Arc is that the seam allowance is 1/4" most of the time. If you don't have a serger you'll be frustrated sewing this on a regular machine, but on a serger it's a dream. Overall, I'm pretty happy with this top. I used up some large scrap pieces and I have a new nursing-friendly garment. I've been nursing on and off for four years so anything I can do to make it a little more fun is appreciated. This is the perfect throw-and-go top on those hectic days when I head out to preschool drop-off. Don't forget to enter the giveaway for a Sewist pin and notebook! Check out Tuesday's post for the details. I think you're right about the lack of seams! With this top all I can do is take in the side seams and that doesn't do much for fitting. I love the idea of a crossover top but the thought of fitting one does put me off, I think the pink one is a better fit and will be a perfect nursing top.